OPI Nail Lacquer, Alpine Snow, 0.5 fl. oz. OPI Nail Lacquer Base Coat, Natural Nail, 0.5 fl. oz. 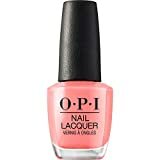 OPI Nail Lacquer Treatment, Start-to-Finish Formaldehyde-Free, 0.5 fl. oz. OPI Nail Lacquer, Got Myself into a Jam-balaya, 0.5 fl. oz. OPI Infinite Shine, Pearl of Wisdom, 0.5 fl. oz. OPI Infinite Shine ProStay Primer & Gloss Duo Pack, 1 fl. oz. OPI Nail Lacquer, This Color's Making Waves, 0.5 fl. oz.